Digital Display– Modern digital control panel with LED light shows temperature and time in an easy to read display. Perfect for Two – Fits up to 4 slices of bread or a personal pizza. Great for smaller serving size needs. Save counter space with easy under the cabinet mounting. 4 Slice or 9” Pizza Capacity. LED Display and Digital Controls. 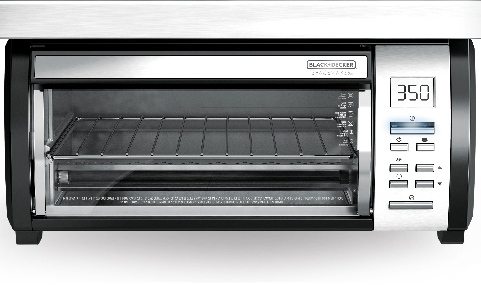 One Touch - Toast, Bake & Keep Warm Controls. Perfect for apartments, recreational vehicles and office nooks where space is limited! Handy templates guide installation onto flat bottom style cabinets. Fits up to 4 slices of bread or a personal pizza. Great for smaller serving size needs. Modern digital control panel with LED light shows temperature and time in an easy to ready display. 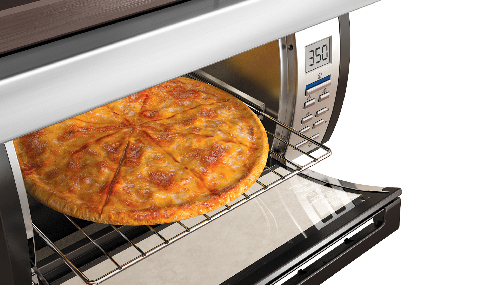 This toaster oven conveniently fits an entire 9" frozen pizza!